The Trust for Public Land and two energy companies announced that they have struck a deal to purchase and work to retire more than 24,000 acres of federal oil and natural gas leases in a rugged area in western Wyoming that includes important wildlife habitat. 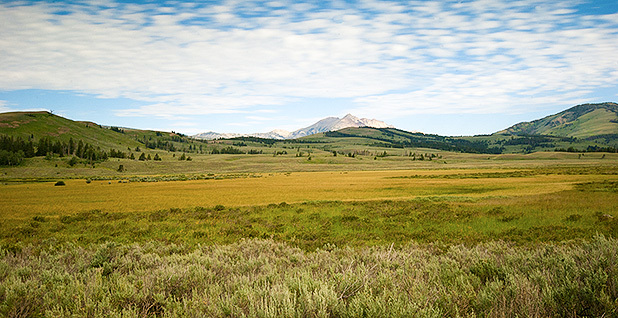 The money to purchase the land came from a donation from Hansjörg Wyss, a billionaire philanthropist and Wyoming resident, through his Wyss Foundation. The Bureau of Land Management will now move to formally retire the leases in an area south of Grand Teton National Park that was protected by Congress nearly a decade ago through legislation that grandfathered in existing leases. The two energy companies that owned the leases and agreed to the buyout are Stanley Energy and Mountain Energy, according to the San Francisco-based Trust for Public Land. "The Wyoming Range offers stunning vistas, great outdoor recreation and diverse wildlife habitat," Wyoming Gov. Matt Mead (R) said in a statement praising the buyout. "The BLM has worked with these companies to close out these leases and provide a good balance of development and environmental considerations." Chris Deming, senior project manager for the Trust for Public Land, said he could not reveal the amount of money donated by the Wyss Foundation, telling E&E News that the "terms of the valid lease acquisition are confidential." The Trust for Public Land has helped raise millions of dollars, through the Wyss Foundation and other sources, to purchase and retire oil and gas leases within the area protected by the Wyoming Range Legacy Act, a bill sponsored by Sen. John Barrasso (R-Wyo.) and included in a sweeping omnibus public lands package in 2009. Barrasso's bill protected more than 1.2 million acres of the Wyoming Range from future oil and gas leasing, but it grandfathered in more than a dozen existing drilling leases covering roughly 120,000 acres. The Trust for Public Land in early 2012 led a three-month fundraising effort with a coalition of environmental groups, private citizens and more than 1,000 donors that raised $8.75 million to purchase and retire leases covering 58,000 acres in the Wyoming Range area (E&E News PM, Jan. 2, 2013). The largest donation — $4.5 million — came from the Wyss Foundation. With the latest purchase of 24,197 acres, the Trust for Public Land says it has now purchased more than 80,000 acres of oil and gas leases, completing a yearslong effort by the group to purchase all the valid leases in the protected area. Deming said that "most" of the other 40,000 acres of leased land "are not valid leases" and have been contested. He said it's up to BLM and the Forest Service to decide the fate of those leases. "Today is a great day for Wyoming and for all those who are passionate about public lands," Molly McUsic, president of the Wyss Foundation, said in a statement. "We applaud all who have given their time and resources over the years and look forward to a future in which the Wyoming Range remains undeveloped and open to all," she added.